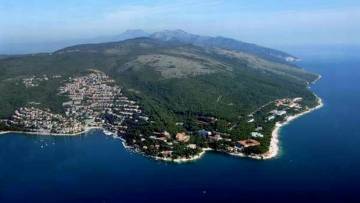 RABAC is a well-known tourist resort lying on the eastern coast of Istria by the town of Labin. Wherever you go, this pearl of the Kvarner Bay, with all its hotels, Apartments, private accommodation and camp sites, still makes you feel the scent and the spirit of the one-time small fishing village. Numerous inlets and small bays, ideal for swimming, luxuriant Mediterranean vegetation, restaurants and taverns with home cooking, night rides in a pleasure or a fishing boat, not to mention the famous hospitality of the Istrian people renowned for their mild temperament, attract the modern and cosmopolitan Europe longing for the calm, sunshine, sea and a variety of pastime and entertainment activities. The first mention of Rabac in the land register dates back to 1826. In the mid-19th century it was a small fishing village with as few as ten houses. The first holiday-makers came to admire its beautiful bay and attractive countryside. The first famous visitor to Rabac was the English explorer, orientalist and travel writer, Sir Richard Francis Burton, who visited the town in 1876. After getting to know Rabac and other towns along the coast, he wrote the book Istrian Coast extolling the beauty and charm of the picturesque town of Rabac. A regular guest of the first hotel was the Austrian officer Kaiser who later bought the Dubrova manor house near the town of Labin. Today, the Dubrova house is known as the venue of the Mediterranean sculpture workshop and a sculpture garden.